The Harvest ITU G2 systems can be used for remote control of equipment from a computer or smartphone, e.g. 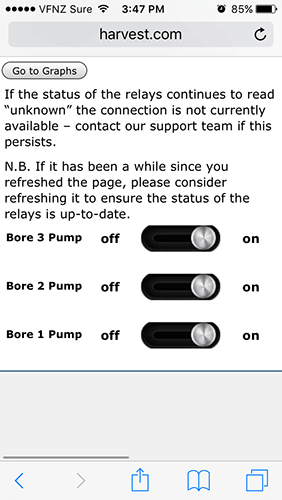 to turn on/off an irrigation pump - see the screenshot below. This is an internet based control system with immediate on screen acknowledgment, rather than a text message which you cannot be sure if or when it has been received. To find out more about remote control on your property, contact our sales team via sales@harvest.com or +64 370 1991 (freephone 0800 HARVEST). Any Harvest system with at least one air temperature sensor can calculate Growing Degree Days (GDD) and Richardson Chill Units (RCU). The GDD and RCU values are displayed alongside the related sensors' graph (see below) for the time period you are viewing, apart from the current day in progress. To view or change your growing season for GDD/RCU calculations, go to "Login and Settings" in the Options menu of your Harvest Webpage. Then scroll down to "Seasons" and use the drop down menu to change the growing season, then click "Save All Options". To set up your Harvest system to show GDD and RCU, contact our Tech Support team via support@harvest.com or +64 370 1991 (freephone 0800 HARVEST). For more information on our Harvest system calculations please visit our system calculations page. We can calculate and display wet bulb temperature for any systems with temperature and humidity sensors. Simply ask our Tech Support team to set this up for you. Wet bulb temperature is very useful if you use water for frost protection. When you first start to apply water, the leaf temperature rapidly drops to the wet bulb temperature, so you must be sure that the water is turned on before the wet bulb temperature gets to zero. To set up your Harvest system to calculate wet bulb temperature, contact our Tech Support team via support@harvest.com or +64 370 1991 (freephone 0800 HARVEST). For any Harvest system with functioning weather sensors, as an add-on service we can push weather data to Aeris who then provide a localised forecast that is displayed on the Harvest Data Portal or Web App. We offer a 1-month free trial of this service. To add a localised forecast to your Harvest system, contact our sales team via sales@harvest.com or +64 370 1991 (freephone 0800 HARVEST). Head to your Harvest webpage and under the "Options" menu at the top of the page click "Download Data". Choose the format, start date and the duration or end date for the period of data you would like to download. The "Split Date/Time" tickbox gives you an option to split the date and time data into two seperate fields. Use the "Custom Fields" to customise the data you would like to download. Logs: If selecting monthly, daily, or hourly logs - options for the minimum, average, maximum or total values for each parameter will appear. You must select at least one of these values. Summary: Use these tick boxes to include easy-to-read summaries for the parameters selected in the next step. Columns: Use these tick boxes to specify the parameters you want to download. Each parameter will have it's own column. The default is set to all parameters. Once you have selected your desired options, click the "Download Data" button at the top of the page and your data should begin to download after a few moments. If you have any issues or questions regarding the downloading of data, please contact our Tech Support team on +64 370 1991 or 0800 HARVEST. With the right sensors, your Harvest weather station can display the risk of Botrytis cinerea and powdery mildew, using the Bacchus and Gubler models respectively. The Bacchus model for calculating Botrytis risk was actually developed in NZ by Dr Balasubramaniam (Bala). Click the image below to see live data, or see our calculations page for more info on the models we use and other calculations possible with the Harvest system. Please contact us to get these risk models displayed on your website. Once logged in, you can access the alarm status through the options menu. Click Alarm Status to view your current alarm configuration. You can also make changes to the alarms in the settings menu. Here, you can also modify the roster (recipients), change the name of the recipient, the type of alarm (txt message, voice call or email) and whether it is enabled or not. You can also modify dates the alarms will be active between. If your system has a Harvest Camera attached to it with images visible on your systems Site (like the one on the Harvest Solway Site) and you wish to embed this image on your personal/company website, you can do it by setting an image source to look at the get latest image command for your site. You will need to obtain the site ID (or SID parameter) from the Site Info section when viewing the graph page, for example the SID for the Harvest Solway Site is 1000. Once you have this you need to create a URL for the img element src so it looks like the following https://live.harvest.com/?sid=YOUR_SID&cmd=getlatestimage for example the Harvest Solway Site would have the link https://live.harvest.com/?sid=1000&cmd=getlatestimage.